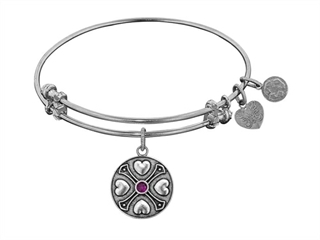 Gives back $.25 of each bracelet to Generation Rescue (autism). This impressive Angelica Collection Antique White Finish Brass February Simulated Expandable Bangle. With over 500 bracelets from which to choose, and our strength behind it, Angelica promises to be a long-lasting success story. * Generation Rescue supports programs to improve the quality of life for those affected by autism. .